Onward to the card. It is a biggy, standing 6 big ol inches square, top fold. 1 - 5-3/4 x 5-3/4 square Baja Breeze Background, stamped with the grass from Inspired by Nature, another fav on the dormant list, drat. Oh, I stamped it with Baja Breeze ink. I wanted just the 'hint" that there was something going on back there. I lined it up with the edge of the card, and drew a line both ways. That way, I knew where to stamp right? Ink your flowers in the same manner as previous posts, put this piece back in your cutter, and chop off the extra part of the circle, staying just inside the pencil lines. Stamp your sentiment now. When I am stamping a sentiment on a piece that I have this much time into, I always use my stamp positioner. If you mounted your stamp just a little off, here is where it will show up and ruin all your hard work. 3 - Take the art piece and attach it to the front of your card. 4 - Add a piece of that Valet Ribbon to the bottom. 5 - Get out that cool new STAMPIN UP BEAUTIFUL BUTTERFLY DIE for your Big Shot - page 196 of your caddy. I cut a couple of scraps from the Parisian Breeze Specialty paper and ran them through over the small butterfly. Because this paper is so thick (it has awesome texture), when you mount these with dimensionals, they really stay up there. Everyone tell Shelli we need more of this paper please, it is so nice to work with. So, pretty easy cards right, a cool little ink technique and there you are impressing the heck out of your friends - remember, give the cards away - you can make more. I played ;0) This card has all the same measurements as the one above, except I took a piece of kraft card stock and ran it through Mr. Big Shot with one of our new TEXTURZ PLATES page 203 of your catty. Now these are just plain old cool. Many of you who have been following me for awhile, know that I'm a closet cuttlebugger. I love those embossing folders, but I dedicated my blog to Stampin Up, so I don't often show you work I have done with them. - NO MORE my little Chickidees, Now we got our very own to play with. So not only did I emboss this piece, these templates are huge by the way, no problem embossing a 5-1/4 piece of cardstock. I then inked the embossing by using a flat sponge, then, well, you know my love of Crystal Effects and I have not played with it for awhile now. I covered the design with Crystal Effects, so now you can really feel the embossing. For the butterflies, I kept these ones the same colors because the background was already pretty busy. I also used very little Close to Cocoa in the art part. I completed the card with that beautiful blue Valet ribbon along the bottom. Darn, I'm out of that, guess I better order more. There you are, two more card ideas. Tomorrow, I have pictures of the stencil I have been playing with. 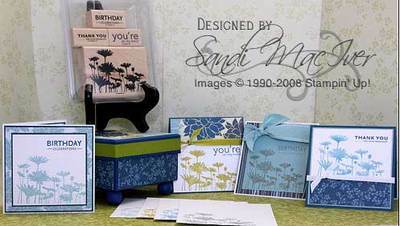 Stampin Ups new stencils are very "sweet". I had to force myself to put it away today and get onto Candi's card request, but, it will be back. So, come on back tomorrow and see what you can do wih some ink and a stencil. until then, thank you so much for stopping by, hope you found some inspiration in today's post. Welcome back, as promised here is the first card from the UPSY DAISY goes Parisian from yesterday. 4 - scrap of Baja Breeze 5-1/4 x 1/2 inch. Add snail adhesive to the back of the kraft piece and attach to top front of card. Add snail adhesive to the top back of the long skinny striped piece of dsp and lay it down over the skinny piece of Baja Breeze. Attach this to bottom front of card. Lay your stamp down on your work surface, face up. Open ink pads, Baja Breeze, Pacific Point and Close to Cocoa (I prefer this to choc. chip), get out a sponge dauber for each color. Starting with Baja, add ink to the big flowers with the sponge dauber. Next, Pacific Point, add some blue to the base of the flowers. Move to Close to Cocoa, add to stems and under flowers. Huff on your stamp to moisten it, stamp it on your piece of Whisper White. Once dry, layer this to your piece of Chocolate Chip. Tie a piece of that SOOOO nice new blue ribbon, Ribbon Originals - Valet. Using dimensionals (foam tape) attach this unit to the front of your card. ANOTHER CARD - this is my entry for the SC214 Challenge this week. One of my new stamp sets is FRIENDS 24-7 so I mounted it and put it to work right away. Still playing with the Parisian Breeze Specialty paper, and something else new - Those ovals are cut with one of our new die cuts. Page 199, very bottom. ORIGINALS DIES - OVALS The Chocolate Chip oval is the large and the watercolor piece the bird is stamp on is the medium. Oh and lets not forget the new LATTE DESIGNER BUTTONS, these are a beautiful rusty brown although they do not show that in the picture. attach layer of 5 & 6 to front of layered 3 & 4. Tie a piece of Valet blue ribbon around, add dimensionals to back of this unit, attach to front of card. 8 - Watercolor Paper (because of the texture matching the paper) - cut a medium oval with the Oval die cutter. 9 - Using Chocolate Chip Ink - stamp the bird on the oval. 11 - Layer this to the Choc. Chip oval, add 3 brads on either side, dimensionals to the back and mount to the front of the card. 12 - add the 3 Latte Designer Buttons down right side. Mail it to someone you really really like - you know you can always make another one right? Phew, I'm tired from all that typing. Thanks for stopping by. Special thank you to all who have been ordering through my site. I very much appreciate your patronage, and yes it does help to pay the blogging expenses. (I'll have a little thank you for you all starting next week). Come on back tomorrow for the 2nd card in Linzie's set. By the way, I think we have talked her into the Upsy Daisy set Yeah, so we are moving on, next stop? It's a secret. Before we get to our Upsy Daisy Stamp Set cards today, I want to show you the new Valet ribbon, page 178 in your catalog. The picture in the caddy so DOES NOT do this ribbon justice. This is the most beautiful ribbon I have ever worked with and I have almost used up a whole package already so you know it is back on the list. The blue is SO BLUE, it reminds me of white sand and water. The Chocolate Swiss dots is just plain old lush, and the black, well it it is textured, corduroy, raised, I don't know exactly what you want to call it, but I keep petting it. You HAVE TO GET SOME OF THIS RIBBON. Ya-all remember this is Linz's fault right? She wanted me to talk her into buying the Upsy Daisy stamp set. I told her to hold off, here is why. Couple more things I opened to play with. Parisian Breeze Specialty papers, they are textured, and the nicest color combo, my new favorite. Baja, Chocolate Chip and Kraft.... except I keep substituting Close to Cocoa for the Chocolate Chip because I want a softer image in that color for the sentiments and background stamping. Also thrown in, is some of the Pin Stripe Kraft from the Taste of Textiles package on page 156. Now I am totally over the top with that package. There is some shimmery Bronze in there, that matches the new glitter Fine Supernova on page 180. Ok, the caddy calls it Chocolate - give it up girls, it's bronze, and yummy. For each of the next 3 days I will give you a recipe for one of these cards and remember, if you need supplies, you can order right from this site, just click the shopping cart up at the top. As always, thank you so much for stopping by. Come on back and make the cards with us over the next 3 days, and after that I'll let you know what else I have been working on. Todays card features the Upsy Daisy Stamp Set. Where did my inspiration for this card come from you ask? From President Obama. I saw him on t.v. the other night, and have you ever noticed the chairs in the oval office, they are Baja Breeze and Sahara Sand. At least they were to me. So, combine that with SC213 design challenge and you have a card. I also used the Urban Garden Designer Paper again and the classic ink pads I used were Baja Breeze, Pacific Point and Kiwi Kiss. When I stamped the sentiment I noticed the little dots before the words on the second line, so I got out my paper piercing kit and did the same thing to the white space on the card. start with Baja Breeze and ink the flowers, then highlight the base of the large flowers and the heads of the small ones with Pacific Point. Add Kiwi to the stems. Huff on the whole stamp, then stamp on your Whisper white. Add your sentiment stamped in Kiwi Kiss. Phew, finally got this project finished. This is a class project for Saturday - September 27th. 1 - 4 P.M. We will be using the Upsy Daisy stamp set found on page 101 of your catalog. The Designer series paper, Urban Garden found on page 168. The class fee is $45.00 (including the stamp set), or $25.00 if you already own the stamp set (need to bring it with you please). You will be making all 4 cards, 4 envelopes and the chipboard box, which I have already added feet to and painted & sealed for you. This is a beautiful keepsake or a treasured gift. If your interested in the class, please contact me ASAP. There are only 4 spots remaining and I need to place the supplies order no later than September 18th. Payment must be made in advance and once the supplies are ordered, is not refundable. Ok, well, this is a short post today, I'm off to finish the other project as you all have been getting after me to post that class too :~) It should be up tomorrow even though I don't intend on regular Sunday Posts, because there is a tight time schedule for ordering the stamp set/dsp for that class, I need to get it to you. Have a wonderful Saturday evening and thanks for stopping by. Good Morning and Happy Friday to you all. My favorite day of the week. Our weather is supposed to hold for the weekend, and it's play day in the studio. We usually have a play day at least once a month. My stamping buddies bring their "stuff", my "stuff" is already there and we play and create all day. They don't know it, but their orders from last week arrived yesterday so when they get here this morning, they will be very surprised. Love new stuff. TODAY'S PROJECT: I have to say, I am LOVING all these new silhouette stamps. They are so versatile and you can really get into some ink. Firstly, the stamp set, UPSY DAISY is on page 101 of the catty and is part of the sale Stampin Up has right now so it can be yours for $16.11 Plus S&T. The URBAN GARDEN designer paper was still out from the previous project, so hey, why not. The card base is a 4.25 square done in Not Quite Navy. Mat is Baja Breeze. I inked the full stamp image in Baja, then using my finger dauber, I added some Pacific Point just to the bottom of the big flowers and the stems, kind of like a shadow. This is stamped on Whisper White, the sentiment added in Not Quite Navy, a piece of DSP along the bottom, and some Whisper White Ribbon. A very fast but very pretty card. Club meeting yesterday was a ton of fun. First we had Patricia's Birthday Lunch with some very fine ladies, then they all crashed the studio. We did a Watercolor Wonder Crayon technique with some gold embossing for beautiful fall cards, then if you saw yesterday's post, the Pocket Silhouette card was their second project. I met some new Friends and we had lots of laughs. Allison was the host and she earned a great hostess set and a bucket full of free stuff. Friends, free stuff and inky fingers, what a great day. Thank you ladies for your support in my new venture. Ok, well, I have to run, clean my house, get some groceries before Play Day today. Birthday Party here tonight for a friend, HAPPY BIRTHDAY BOBBY (I didn't do it!). Hope you all have a safe relaxing wonderful weekend. Hug your friends, scritch your doggy, pet your kitty, do something nice for a complete stranger and see you next week with more stamping fun.